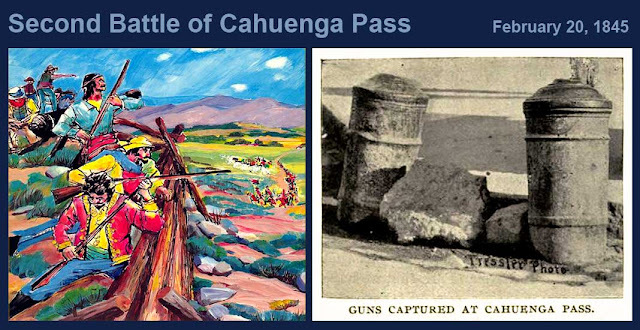 On 10/08-09/2011 the Dominguez Rancho Adobe Museum (18127 S. Alameda St., Rancho Dominguez, CA 90220; 310-603-0088) hosts the 3rd annual re-enactment of the Battle of the Old Woman’s Gun (a.k.a., Battle of Dominguez Ranch, Battle of Rancho Dominguez, Battle of San Pedro, etc.) with living history demonstrations, presentations, dancing, costumes, and two battle re-enactment—with cannon. 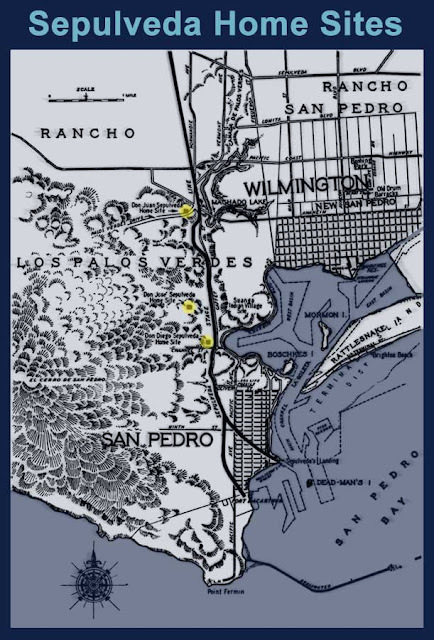 My San Pedro commemorates both sides in the conflict with excerpts from an American’s eyewitness account and a tribute to the quixotic old cannon with the endearing name which saved the day for the Californians (images are excerpted from the forthcoming My San Pedro Pedro-centric timeline of the Mexican-American War—The Battle of San Pedro). “At 9:30 A. M. we commenced working out of the harbor of San Francisco on the ebb tide. The ship anchored at Saucelito [sic. ], where, on account of a dense fog, it remained until the 4th, when it put to sea. “Brevet Capt. 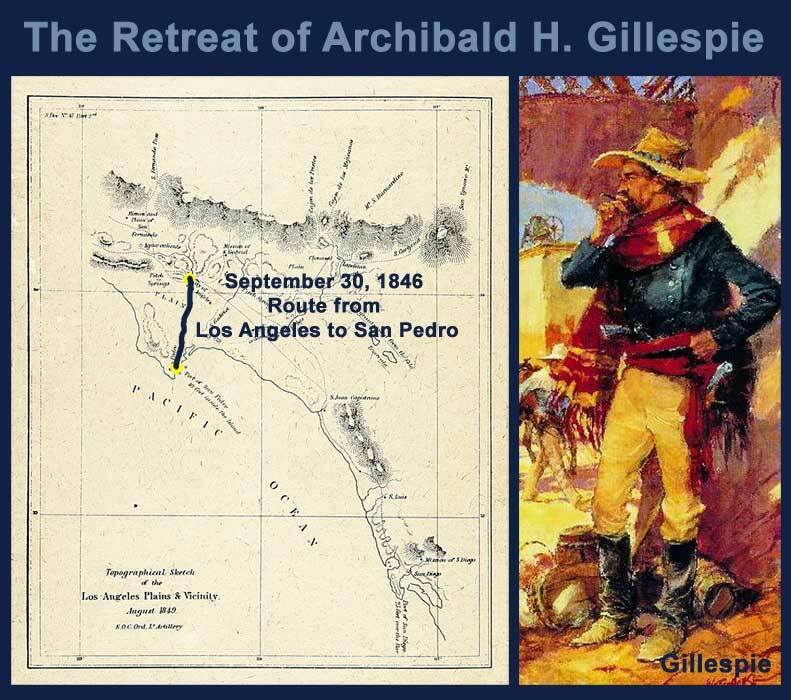 Archibald Gillespie came on board and reported that he had evacuated the Pueblo de Los Angeles on account of the overpowering force of the enemy and had retired with his men on board the Vandalia after having spiked his guns, one of which he threw into the water. 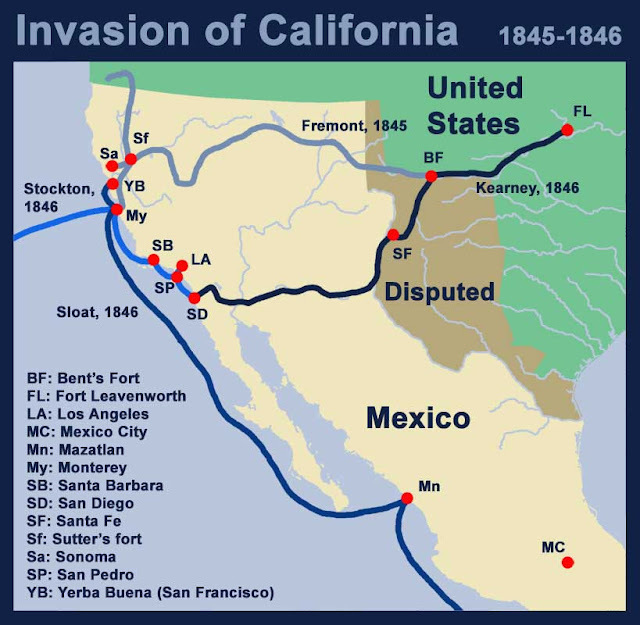 He also reported that the whole of California below the pueblo had risen in arms against our authorities, headed by Flores, a Mexican captain on furlough in this country, who had but a few days ago given his parole of honor not to take up arms against the United States. “We made preparations to land a force to march to the pueblo at daylight. 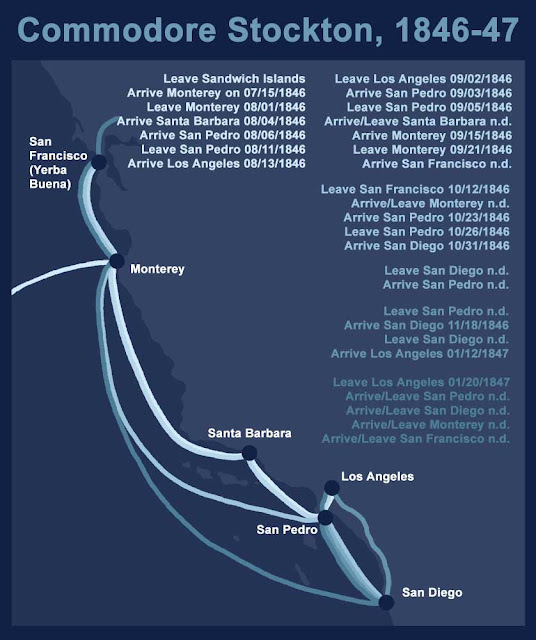 “October 8 (1846), at 6 A.M., all the boats left the ship for the purpose of landing the forces, numbering in all 299 men, including the volunteers, under command of Capt. Gillespie. “At 6:30 all were landed without opposition, the enemy in small detachments retreating toward the pueblo. From their movements we apprehended that their whole force was near. Capt. Mervine sent on board ship for a reinforcement of eighty men, under command of Lieut. R. B. Hitchcock. “At 8 A. M. the several companies, all under command of Capt. 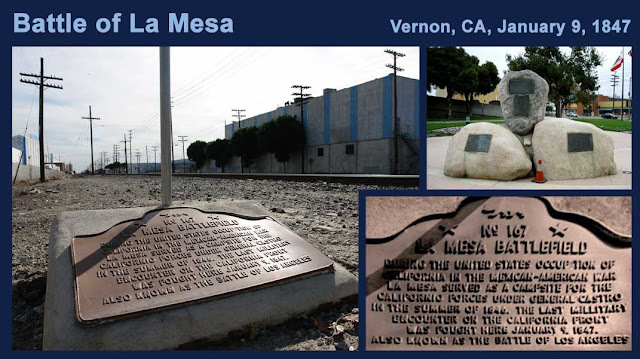 William Mervine, took up the line of march for the purpose of retaking the pueblo. The enemy retreated as our forces advanced. “The reinforcements under the command of Lieut. R. B. Hitchcock returned on board ship. 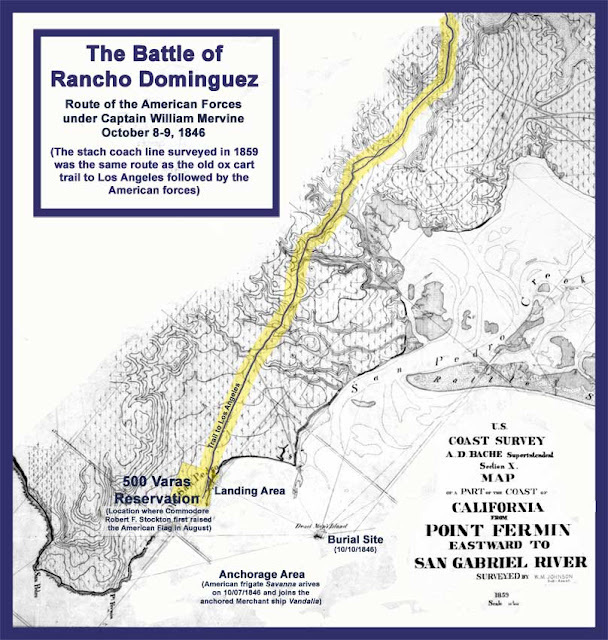 “For the first four miles our march was through hills and ravines, which the enemy might have taken advantage of, but preferred to occupy as spectators only, until our approach. A few shots from our flankers (who were the volunteer riflemen) would start them off; they returning the compliment before going. The remainder of our march was performed over a continuous plain overgrown with wild mustard, rising in places to six or eight feet in height. The ground was excessively dry, the clouds of dust were suffocating and there was not a breath of wind in motion. There was no water on our line of march for ten or twelve miles and we suffered greatly from thirst. “At 2:30 P. M. we reached our camping ground. The enemy appeared in considerable numbers. Their numbers continued to increase until towards sundown, when they formed on a hill near us, gradually inclining towards our camp. They were admirably formed for a cavalry charge. 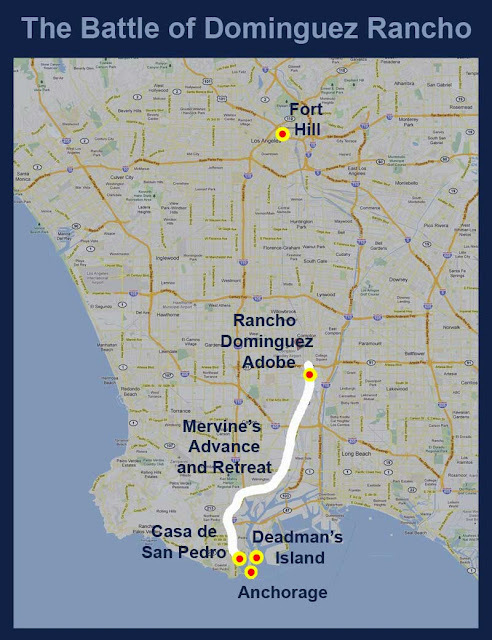 “We drew up our forces to meet them, but finding they were disposed to remain stationary, the marines, under command of Capt. Marston, the Colt's riflemen, under command of Lieut. L.B. Carter and myself, and the volunteers, under command of Capt. A. Gillespie, were ordered to charge on them, which we did. They stood their ground until our shots commenced 'telling' on them, when they took to flight in every direction. “They continued to annoy us by firing into our camp through the night. “About 2 A. M. they brought a piece of artillery and fired into our camp, the shot striking the ground near us. The marines, riflemen and volunteers were sent in pursuit of the gun, but could see or hear nothing of it. “We left our camp the next morning at 6 o'clock. Our plan of march was in column by platoon. “We had not proceeded far before the enemy appeared before us drawn up on each side of the road, mounted on fine horses, each man armed with a lance and carbine. “They also had a field piece (a four-pounder), to which were hitched eight or ten horses, placed on the road ahead of us. “Capt. Mervine, thinking it was the enemy's intention to throw us into confusion by using their gun on us loaded with round shot and copper grape shot and then charge us with their cavalry, ordered us to form a square—which was the Order of march throughout the battle. “When within about four hundred yards of them the enemy opened on us with their artillery. We made frequent charges, driving them before us, and at one time causing them to leave some of their cannon balls and cartridges; but owing to the rapidity with which they could carry off the gun, using their lassos on every part, enabled them to choose their own distance, entirely out of all range of our muskets. 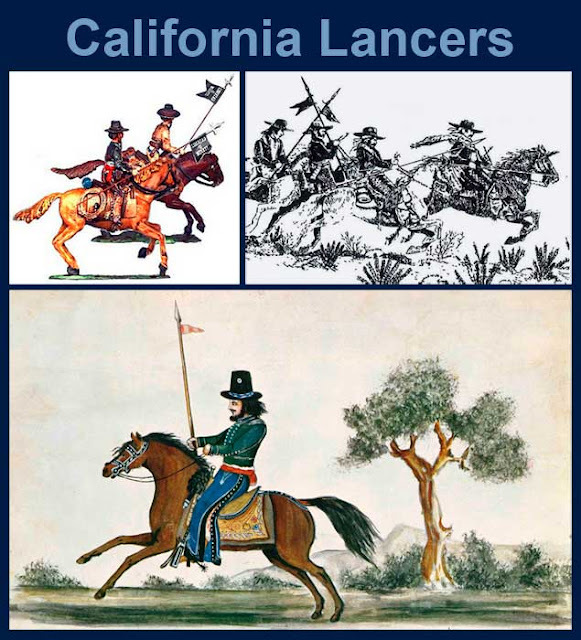 “Their horsemen kept out of danger, apparently content to let the gun do the fighting. They kept up a constant fire with their carbines, but these did no harm. The enemy numbered between 175 and 200 strong. “Finding it impossible to capture the gun, the retreat was sounded. The captain consulted with his officers on the best steps to be taken. It was decided unanimously to return on board ship. 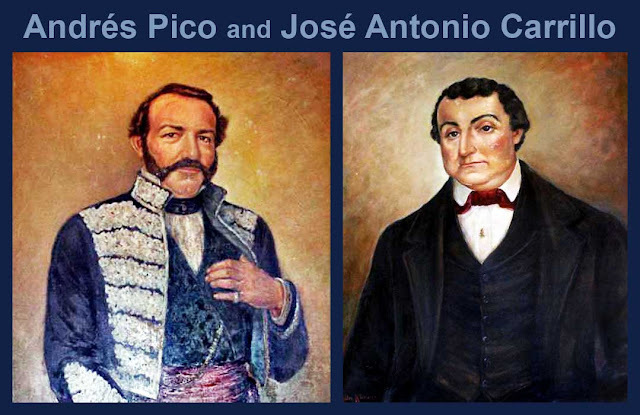 “To continue the march would sacrifice a number of lives to no purpose, for, admitting we could have reached the pueblo, all communications would be cut off with the ship, and we would further be constantly annoyed by their artillery without the least chance of capturing it. It was reported that the enemy were between five and six hundred strong at the city and it was thought he had more artillery. 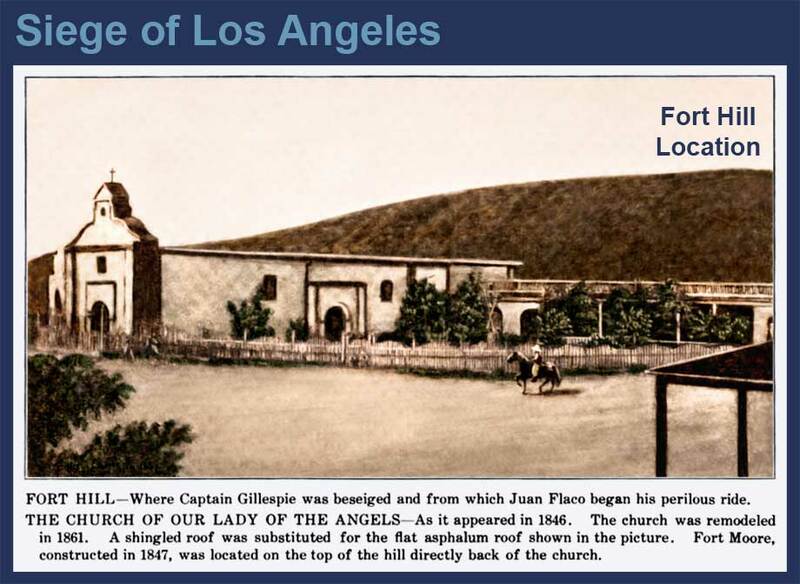 “On retreating they got the gun planted on a hill ahead of us. “The captain made us an address, saying to the troops that it was his intention to march straight ahead in the same orderly manner in which we had advanced, and that sooner than he would surrender to such an enemy, he would sacrifice himself and every other man in his command. “The enemy fired into us four times on the retreat, the fourth shot falling short, the report of the gun indicating a small quantity of powder, after which they remained stationary and manifested no further disposition to molest us. “We proceeded quietly on our march to the landing, where we found a body of men under command of Lieut. Hitchcock with two nine-pounder cannon got from the Vandalia to render us assistance in case we should need it. "We presented truly a pitiable condition, many being barely able to drag one foot after the other from excessive fatigue, having gone through the exertions and excitement in battle and afterwards performing a march of eighteen or twenty miles without rest. "This is the first battle I have ever been engaged in, and, having taken particular notice of those around me, I can assert that no men could have acted more bravely. Even when their shipmates were falling by their sides, I saw but one impulse and that was to push forward, and when the retreat was ordered I noticed a general reluctance to turn their backs to the enemy. John Anderson (seaman), severely wounded; recovery doubtful. “On the following morning we buried the bodies of William A. Smith, Charles Sommers, David Johnson and Michael Hoey on an island in the harbor. “At 11 A. M. the captain called a council of commissioned officers regarding the proper course to adopt in the present crisis, which decided that no force should be landed, and that the ship remain here until further orders from the commodore, who is daily expected. 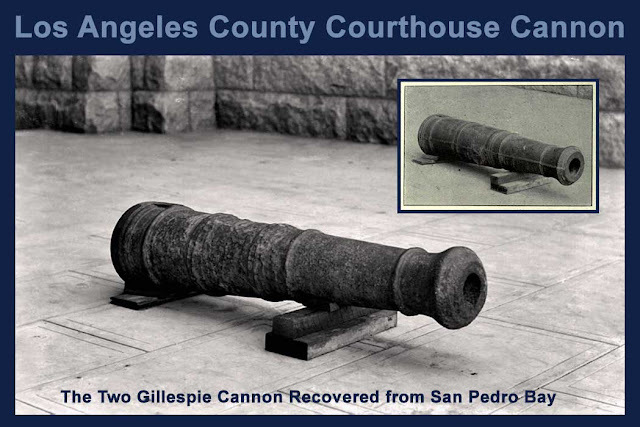 The bronze four-pounder cannon, known as a pedrero or swivel gun, had long served duty on the Los Angeles Plaza—firing salutes and celebrating the holidays. Battle of Dominguez Ranch: Mounted on the forward axle of a Jersey wagon with rawhide thongs, and pulled by 6-10 horsemen using riatas tied to their saddles, the Old Woman’s Gun repels the march of about 300 Americans intent on recapturing Los Angeles. 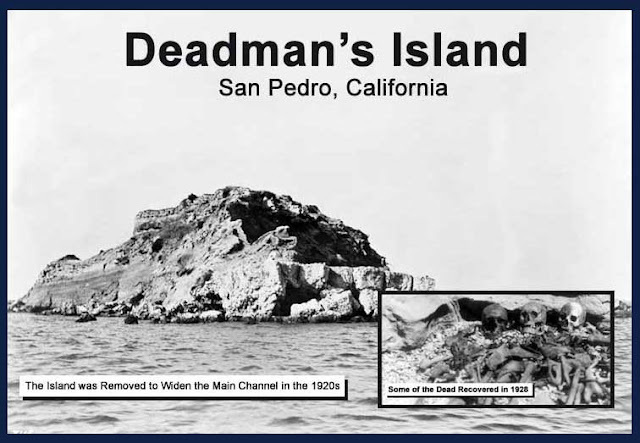 Juan Sepulveda (according to Alexander Bell) claims the cannon fired from Deadman’s Island in San Pedro Bay to celebrate the Fourth of July is the original Old Woman’s Gun, which he had hidden at his ranch. 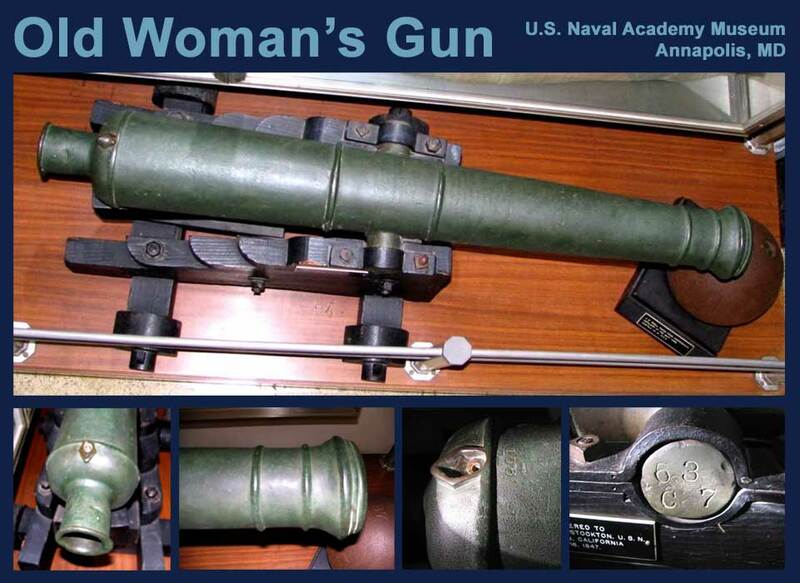 The Old Woman’s Gun (Trophy No. 53) is exhibited at the New Orleans Exposition [New Orleans Universal Exposition and World's Fair; World's Industrial and Cotton Centennial Exhibition; New Orleans Centennial]. 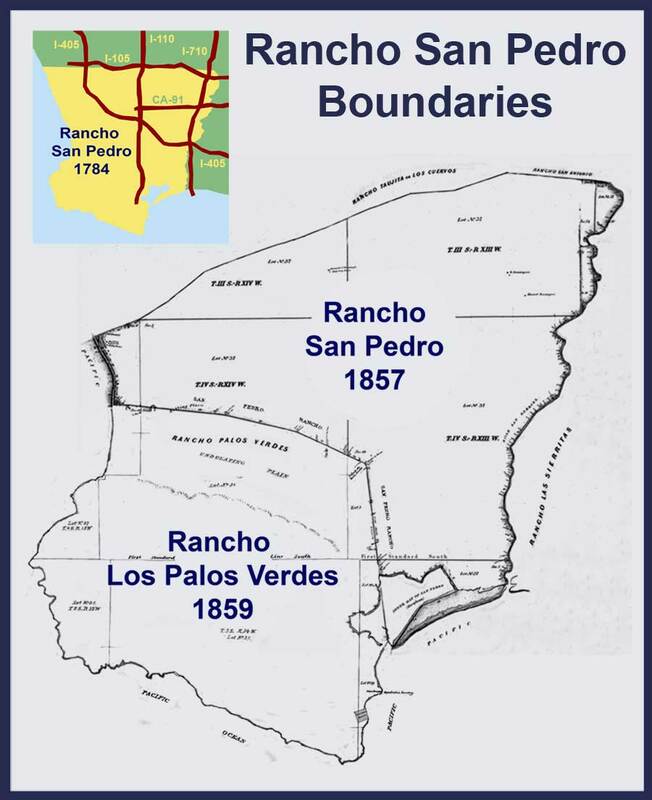 Hey I am a grad student doing a poster which looks at a couple of different battlefields in SoCal. I was wondering if it's okay that I use some of your images from this site in my poster. I'll reference you and your blog, of course. Thanks for making this post!